Hiya errrybody! It’s just me ‘n Pahlish again! 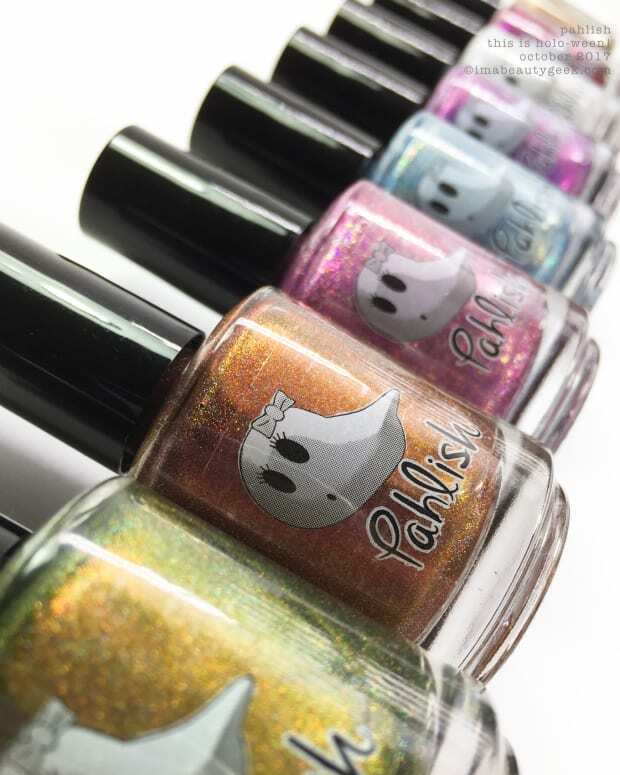 Hot on the heels of This is Holo-ween (my most favouritest collection of the entire year), Pahlish is releasing a whopping 12-shade, 12 Days of Christmas collection for Holiday 2017. And wait – there are two Gift-With-Purchase shades too. Gah! So many pretties! Pahlish Partridge in a Pear Tree – Holiday 2017 (above). Hmm… am I supposed to write notes for these? Did you need notes? Or can you just look at this and go… “unhhh… perfect neutral love!”? 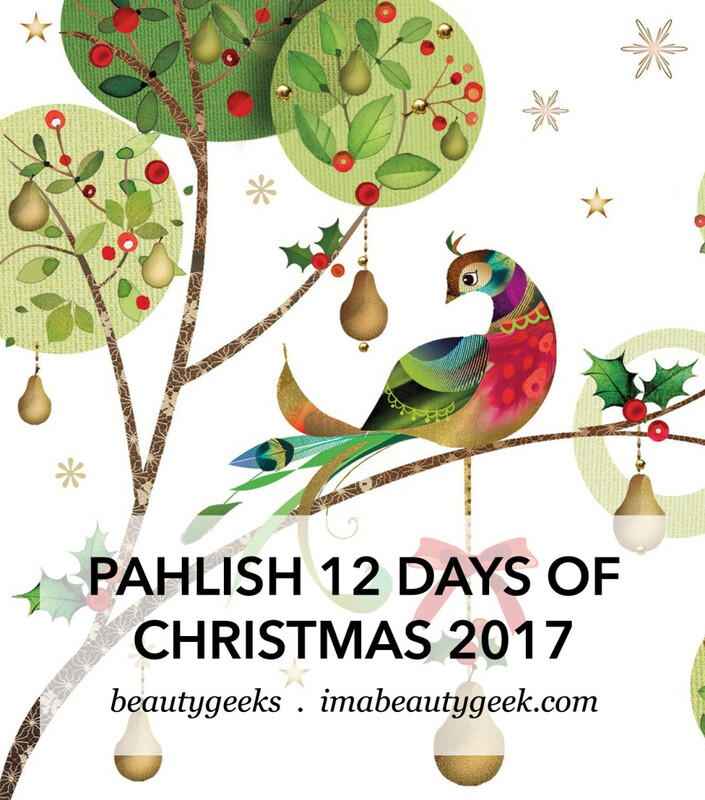 Pahlish Partridge in a Pear Tree – 12 Days of Christmas 2017 (above). It’s flecky with shimmerz. I could say things about multichrome flakes or holo flakes, but really, it’s just sophisticated, special and soothing. Pahlish Two Turtledoves – Holiday 2017 (above). This one is kind of neat. It has slight duo shifty from a dusty blue-grey to dusty grey-blue and those little holo flakes remind me of the first sprinkle of snow before a big, fat storm. Pahlish Two Turtledoves – 12 Days of Christmas 2017 (above). Oh yeah! That’s only 2 coats but I’ve done them a little thicker than I normally would so if you’re a skim-coater, you’ll need 3. Pahlish Three French Hens – Holiday 2017 (above). I’ve only done 2 coats here and I could have maybe done 3. I went in thin because I really wanted that greeny shimmer to punch you in the eye. Pahlsih Three French Hens – 12 Days of Christmas 2017 (above). I should mention that everything from the 12 Days requires top coat to pop shine. Don’t think you can get away without top coat – you need it to bring out all the subtleties lurking in these creations. Pahlish Four Calling Birds – Holiday 2017 (above). I know, right? That’s 3 coats of this perfect holiday party shade and, if you run from pinky up to middle finger, you’ll see it’s actually shifty. I never realized I could capture a shift using mixed lighting but there you go! It’s kind of like finally getting a picture of a unicorn! Pahlish Four Calling Birds – 12 Days of Christmas 2017 (above). Oooh… skittery-scattered tiny rainbow bits! Pahlish Five Rose Gold Rings – Holiday 2017 (above). Ermahgerd! Big huge heart eyes! Pahlish Five Rose Gold Rings – 12 Days of Christmas 2017 (above). This year there ain’t gonna be a Formula X Alchemy, and really I don’t care because… I now haz this insane foil bottle of Big Huge Heart Eyes!!!! Pahlish Six Geese a Laying – Holiday 2017 (above). That’s 2 coats and I should really have done 3 to get to max saturation, huh? I didn’t though, just so you could see what it’s made of. Fleckies, flakies, and shimmers aplenty! Pahlish Six Geese a Laying – 12 Days of Christmas 2017 (above). If I’d just given it one more coat, I’ll betcha a smillion bucks it would look exactly like the bottle shade. #TooLate #FacePalm. Pahlish Seven Swans a Swimming – Holiday 2017 (above). This is blue, but I can’t get it to show straight up blue on account of the red and violet shimmers and flakes that are jammed in there. It’s totally nuts how blurple it comes out, huh? Pahlish Seven Swans a Swimming – 12 Days of Christmas 2017 (above). I’m supposed to be thinking of clever things to say about this saturated blurple but all I can focus on is these potato chips that I’m eating (for breakfast) at 4pm. #TrueStory. Pahlish Eight Maids a Milking – Holiday 2017 (above). I adore the colour of this – a lot. That’s 3 coats (+top) and for me, it’s still just a touch too sheer. Pahlish Eight Maids a Milking – 12 Days of Christmas 2017 (above). With all those pretty glittery flakes in there, it’s just so floaty and lovely that I can barely stand it. Yes, I should have given her underpants, but hey, it’s 14 shades and I ain’t got time for underpants! Pahlish Nine Ladies Dancing – Holiday 2017 (above). This right here is 2 coats (+ top) of my absolute favourite thing of all the 14 bottles I swatched here for you. I know, right? It’s red! Manigeek doesn’t love red. Manigeek doesn’t even like red. Manigeek barely tolerates red. Manigeek LOVES this red! Congratulations, Shannon, you broke Manigeek. Pahlish Nine Ladies Dancing – 12 Days of Christmas 2017 (above). Seriously, it’s crazy how much I love this red. I don’t know what’s wrong with me. #Broken. Pahlish Ten Lords a Leaping – Holiday 2017 (above). Ten Lords is so silver-platinum bright that I think you can see it from space. Pahlish Ten Lords a Leaping – 12 Days of Christmas 2017 (above). There’s so much stuffed into this bottle that you’d never believe it. Somehow it all comes out looking like a uniform, blisteringly bright silver. Oh – and there’s holo sparklies too, but they’re tricky to pop in this mixed lighting thing I’ve got goin’ on. Pahlish Eleven Pipers Piping – Holiday 2017 (above). Oooh! Lookit dat greeeen! It’s soooo goooooood! That’s 3 coats and you run from pinky to middle, you’ll see evidence of the shimmer in there that gives this vibrant deep green a hint of a shift. Pahlish Eleven Pipers Piping – 12 Days of Christmas 2017 (above). I ain’t never used a green like it. I’m keeping it forever. Pahlish Twelve Drummers Drumming – Holiday 2017 (above). It’s another one that I should have used 3 coats on and didn’t. You&apos;ll learn from my mistakes, yes? Pahlish Twelve Drummers Drumming – 12 Days of Christmas 2017 (above). Yep, shoulda done 3 (or at least 2 thicker coats) and then shoulda used a juicy top. It’s okay though, because I still gots the bottle and I can try again anytime I like! Pahlish Tangled Tinsel – Gift with $75 Purchase Holiday 2017 (above & below). She’s so pretty and somehow light and airy! You’ll need to build her and I think that’s 3 coats, but hey, for that kind of payoff, do it! Pahlish The Mouse King – Gift with $50 & $75 Purchase Holiday 2017 (above & below). Dunno why, but this Pahlish polish just makes me smile. It looks so simple, but then you get right up on it and there’s all these little flake-tastic surprises! I love surprises! And that’s it! 14 shades of Holiday from Shannon&apos;s Pahlish! As usual, there’s a whack of important fine-print ordering information you’ll need to know and I could give it to you all here or you can just head on over to Pahlish.com and read it all for yourself. I know you’re going there anyhow to add a bunch of Days of Christmas to your shopping list so get on it! Go! PS. Black Friday pre-ordering of The Limited Edition 12 Days of Christmas starts midnight November 23rd and runs until midnight November 28th. There will be markdowns across the site and pre-orders should ship by December 15th. For all other non-preorder things, shipping may take longer than you think, so read all the stuffs so you know what to expect. Manicures & Photos Karen Falcon (she drank an Aranciata with her potato chip breakfast and she doesn’t even feel guilty about it).